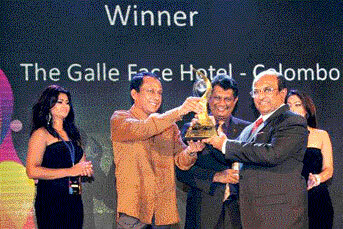 The Galle Face Hotel established in year 1864 was the winner for Best Host Hotel for Heritage at the Sri Lanka Tourism Awards held recently. “The Legendary Galle Face Hotel” - oldest hotel in the World East of the Suez Canal on the Sunshine Indian Ocean Island of Sri Lanka”, is a 146 year old hotel which has been in continuous business from its inception in 1864. It is considered to be the oldest purpose built hotel east of the Suez Canal, originally catering to the guests of then Colonial Governor – whose residence was across a leisure park (Galle Face Green). Over the years Galle Face Hotel has had the distinction of having accommodated Royalty, Heads of State, film personalities and a whole host of distinguished guests. The Hotel now is popularly know as “Sri Lanka’s Heritage in Hospitality” and caters to the most sophisticated corporate clientele, Government and foreign dignitaries and the up market tourists. In the heart of Colombo, the commercial capital of Sri Lanka, regally stands the Galle Face Hotel, a premier legend, one of Asia’s best! With an impressive arched façade that overlooks the Galle Face Green, the hotel borrowed its name from this charming promenade way back in 1864. Built by four British entrepreneurs who were looking to start a business in the city, Galle Face Hotel is the only city hotel bordering the Indian Ocean. The Hotel follows a simple philosophy of offering guests the romance of old world charm, complete with modern day luxuries that enhance the experience. The Galle Face Hotel is owned by Sanjeev Gardiner who is also the Chairman of the Galle Face Hotel Group which owns the Kandy Queens Hotel, Hotel Suisse, Lihiniya Surf Hotel Bentota and Ceylon Hotel’s Corporation.